"To read a good book is to transcend time." Welcome to my official website! If you love magical and mysterious stories, then you've come to the right place. I'm Victoria Lindstrom, and I've enjoyed penning tantalizing tales for children for much of my adult life. Storytelling is a passion for me, and I enjoy developing elements of heroism in the most unlikely characters within the whimsical stories that I write. 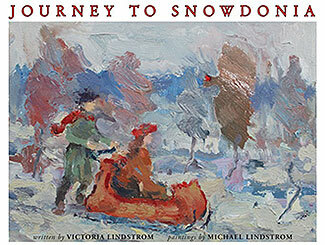 Journey to Snowdonia is my second Lindstrom Wintertime Tale, and was illustrated by my husband, fine artist Michael Lindstrom. It's a yuletide story that was inspired by our trip to the United Kingdom in 2014. An old photo of my maternal great-grandfather—taken in his London home—also contributed to my interest in crafting a book set in England and North Wales. Be sure to browse around the website to see more fun and fantastic tidbits. My writer's blog, Writ of Whimsy, is where you'll find my news and upcoming events. Feel free to contact me via email, Facebook, Twitter, or Pinterest; I love to hear from readers, parents, teachers, and librarians. Thanks for stopping by my website—I hope you enjoyed your visit! Site design © & maintenance by xuni.com. All content © 2014-2019, Victoria Lindstrom.